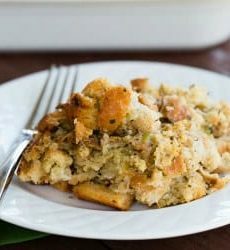 An easy recipe for classic bread stuffing. Preheat oven to 400 degrees F. Butter a 9x13-inch casserole dish; set aside. In a large skillet, melt the butter over medium-high heat. Add the celery and onion and sauté until softened, stirring occasionally, about 8 to 10 minutes. Stir in the parsley, sage, thyme and marjoram, and cook until fragrant, about 1 additional minute. Transfer to a very large mixing bowl. Add the bread cubes, chicken stock, eggs, salt and pepper, and stir with a rubber spatula or wooden spoon to distribute the dry and wet ingredients evenly. Turn the mixture into the prepared casserole dish. Cover with foil and bake for 25 minutes. Remove the foil and continue to bake until golden brown, 25 to 30 additional minutes. Allow to sit for 10 minutes before serving. Make-Ahead: The stuffing can be assembled in the baking dish, then wrapped tightly in plastic wrap and refrigerated for up to 24 hours before baking. To bake, let the stuffing stand at room temperature for 30 minutes. Remove the plastic wrap and proceed with step #4.